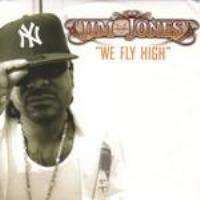 (2006) "We Fly High (Remix)"
"We Fly High" is a song by American hip hop recording artist, Jim Jones, released as the lead single from his third studio album, Hustler's P.O.M.E. (Product of My Environment) (2006). The song is Jim Jones' highest-charting single to date, charting at number five on the Billboard Hot 100. It was produced by Zukhan-Bey who produced his previous single, "Baby Girl". The intro of the song uses a sample of "Mr. Cool" by Rasputin's Stash. The music video was directed by Dale Resteghini (aka RAGE) and Jim Jones (aka CAPO). Cam'ron, Juelz Santana, Max B and Stack Bundles make cameo appearances. Jones' girlfriend, Chrissy Lampkin, and his manager, Yandy Smith, of VH1's Love & Hip Hop fame also make appearances in the music video. Parts of the music video were filmed in front of a green screen. (2006) "I'm a Flirt (Remix)"
(2006) "Make It Rain (Remix)"
(2006) "Tell 'em What They Wanna Hear"
The official remix of the song features fellow American rappers T.I., Diddy, Juelz Santana, Birdman and Young Dro. It is featured on Jim Jones' compilation album A Dipset X-Mas and released as its lead single. The album and digital download versions of the remix features an additional verse by Jermaine Dupri after Diddy's verse. The remix video was directed by Dale Restighini (aka RAGE) and Jim Jones (aka CAPO), who directed the original. It premiered on December 1 on Access Granted on BET. The video contains an extra verse from Juelz Santana that was recorded for the Beef Mix. The music video has cameos from Lil Wayne, DJ Drama, J.R. Writer, & Trae. In the video, at the end while Jones is talking, he waves his hand in front of his face, in the style of Tony Yayo. Also, in some parts of the video, Jones, Birdman, Lil Wayne and Juelz Santana appear with a red bandanna hanging from their right pocket, probably referencing to the Bloods gang. Soon after "We Fly High" was released, Jay-Z recorded a diss aimed at Jim Jones, entitled "Brooklyn High", over the same beat. The chorus contains the vocals of Jones and others, but the phrase "BALLIN'!" was replaced by Jay-Z yelling "Brooklyn!". The song is thought to be disrespectful of both Jones and Cam'ron, another Dipset hip hop artist. Jim Jones has released a rebuttal to Jay-Z's song "Brooklyn High" also on the "We Fly High" beat. Less than a day after Jay-Z's retaliative record came out, Jim Jones and Juelz Santana released a remix called "We Fly High (Beef Mix)" in response to Jay-Z. The song's popularity began throughout the US in October 2006 when the New York Giants' Michael Strahan and fellow team-mates began taking "jump shots" to celebrate sacks against the Washington Redskins. Because of this incident, the NFL issued a "clarification" two weeks after the Giants/Redskins game to remind the Giants that if their celebrations included two or more players, that they would be penalized for unsportsmanlike conduct. The song is also popular across North America; when played in the clubs, it is typical for everyone to take "jump shots" when Jim Jones says "ballin'". The dance in the video along with the jump shot has been named the "Fadeaway" by Jones. WWE's Montel Vontavious Porter, is known to do the "Fadeaway" jump shot before dropping an elbow on his opponent. The crowd often cheers "ballin'" before the elbow drop. Homicide celebrated with this song after defeating Bryan Danielson for the ROH World Championship in his hometown of New York City at the Manhattan Center. Combat Zone Wrestling group BLKOUT has also used the song as its entrance theme. The song has become Jim Jones' most successful single to date, peaking at #5 on the Billboard Hot 100, becoming his first top ten single. The single also remains his most successful single on the Hot R&B/Hip-Hop Singles & Tracks and Hot Rap Tracks, peaking at #4 and #1, respectively, and has also ranked as #1 on the Hot RingMasters chart. It has been certified Platinum by the RIAA, as a digital single and as a "Master Tone" (a.k.a. Ringtone). Jones has also made a "We Fly High" remix for the New York Giants and a "We Fly High" reggaeton version remixed by the famous reggaeton producer; Nely 'El Arma Secreta', or 'The Secret Weapon', which features Jones, Tego Calderón and Don Omar. On the BET show Rap City, The Game used the second verse from his new album Doctor's Advocate from the song "Too Much" while rapping on the "We Fly High" beat. It was also featured in the Electronic Arts game Def Jam Icon. Soulja Boy's song "Report Card" samples the Ballin ad-lib. Infamous YouTube satirist Tony Pinto uses this song during the introduction and conclusion of his videos supporting the PlayStation 3 video game console, under the pseudonym "Chad Warden". He infamously called it the "PS Triple". ↑ "Jim Jones – Chart history" Billboard Hot 100 for Jim Jones. Retrieved November 19, 2011. ↑ "Jim Jones – Chart history" Billboard Pop Songs for Jim Jones. Retrieved November 19, 2011. ↑ "Jim Jones – Chart history" Billboard Hot R&B/Hip-Hop Songs for Jim Jones. Retrieved November 19, 2011. ↑ "Jim Jones – Chart history" Billboard Hot Rap Songs for Jim Jones. Retrieved November 19, 2011. "Na Na Nana Na Na"